Even as tensions continue to simmer over adding Mayor Ed Koch’s name to the Queensboro Bridge, a friend who’s founding the North Brooklyn Boat Club wrote to me regarding a name change for the East River that flows beneath it. “Nature sightings started before we even left off when Dan saw a jellyfish bobbling around. There are jellyfish in the East River? Sure, that makes sense,” wrote Wren Longno. As a tidal strait completing the circle of Long Island from the harbor to the Sound, the life of the East River (or as I prefer to call it, the Gotham Strait) is entirely oceanic. It’s easy to forget, however, with highrises, highways, skyscrapers, parking lots, airports, and sitting parks bounding the entire length of the waterway. The gulls, seaweed, salt air, and the humble jellyfish remind us of the salient fact of our location. We are ocean islanders. But recent research has added a new dimension to our relationship with the jellyfish: their recent population boom might herald worldwide decline of marine ecology. “When you knock out species, other species fill in the gap, sometimes from lower down the food chain. The problem with that in this case is that jellyfish are not exactly pleasant, they don’t have much commercial value, and they’re a pain in the neck for many communities,” said Dianne Saenz, North American communications director for Oceana, a global ecology advocate. 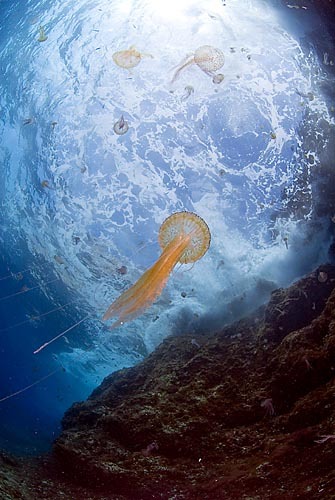 Oceana provided the above photo, by Carlos Suarez, of the jellyfish now plaguing Spain. We’ve over-fished sharks, turtles, and tuna, among other creatures further up the food chain. Jellyfish are reproducing without checks and have less competition for the feeding on fellow zooplankton. Once their biomass tips the scales in a region, even restocking fish won’t work because it’s hard to shoehorn species into vast seas of jellyfish. Indeed, some of the invertebrates eat the very fish (especially juveniles) we’d seek to reintroduce. Waves of jellyfish are chasing swimmers back to shore in the Mediterranean. The Gulf of Mexico has been a pool of jellyfish in some recent summers. In Northern Ireland, global climate change is being eyed as possibly contributing to a jellyfish invasion that wiped out stocks of penned organic salmon. Chinese and Japanese fishers are trying to contend with jellyfish crowding out the fish that provide their livelihoods. We can’t even accurately measure how had the problem is, or how fast it’s advancing, because jellyfish don’t show up on radar, sonar, or satellite images very well. After all, they typically are composed of up to 98% water, less than one percent collagen, salt and other trace minerals. One thing biologists often slap lay people for is referring to some creatures as “primitive.” I understand their argument; adaptation is measured in genetic success – longevity and progeny, not brains or beauty. Some, including the great Stephen Jay Gould, go as far as to say that bacteria rule the Earth, not our self-involved primate species. This pushes the argument too far; the facts are left wanting for a poetic thread. I believe in the inherent value of complex order within individuals as well as ecosystems. Whether your sentiments are those of an artist or an engineer, nature teaches an appreciation of refinement. Yes, many species of jellyfish have a ghostly beauty, and they have a fascinatingly simple, elegant structure. They are most prominently a bell and tentacles (in most species). There’s no brain or central nervous system but they can see changes in light and shade with a 360-degree scope and can smell and touch. They thrive without specialized digestive, respiratory, or circulatory systems. Some glow with sublime bioluminescent displays. But I don’t want them crowding out the dizzying array of species who have developed in the 650 millions of years since its Cnidaria or Coelenterata phylum appeared on the scene. 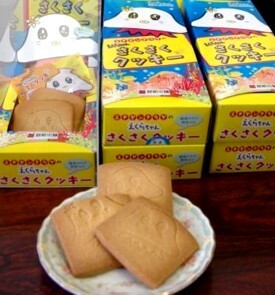 One solution, offered by the Japanese on the island of Fukui, is to eat them in cookies. But, as Florida State University food scientist Yun-Hwa “Peggy” Hsieh cautioned me, jellyfish don’t provide a complete nutritional protein. Once dried, what remains is nearly pure Type 2 collagen, she said. According to Hsieh, Florida has the first large U.S. jellyfish export industry, mostly to Asia, but species in that region are smaller than in northern Asia. That means they have a higher waste proportion, and so they require more labor. In short, the real economic benefit is to tourism, by keeping beaches desirable, not the fish processor. Cosmetics companies frequently send queries to Hsieh, seeking advice on turning jellyfish into Angelina Jolie pouts and other Cosmo Girl miracles. Hsieh politely takes their calls but the real goldmine, she believes, is in using their Type 2 collagen as a therapy for rheumatoid arthritis. One can imagine a government program to seed industrial interest in using jellyfish for adhesives or biomechanics and implants, or a George Washington Carver of jellyfish promoting many uses for the species. Regardless of the uses we find for jellyfish, one thing is for certain: we’re exhausting the seas for animal protein as terribly as we are the land. Lab-grown meat might a biotech savior at some point, but the ready solution is veganism. As a media center with a boisterous vegan community, New York City is well positioned to help lead that culture change. In terms of wildlife protection, habitat preservation, and energy conservation (and resulting pollution and carbon emissions), glamorizing veganism might prove more critical to the world at large than our city’s leadership in mass transit, “green” building, and the humane density made possible by tree planting. If you’d like to get active as a volunteer promoting ocean ecology, veganism, or natural sciences, contact the Mayor’s Volunteer Center for help finding a great organizational partner.